It’s a pink elephant on parade! 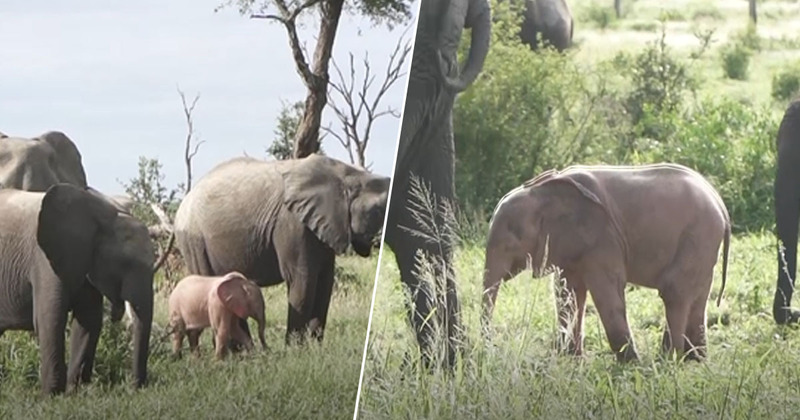 A ‘very rare’ pink elephant has been spotted playing with its family in the grasses at the MalaMala Game Reserve in Kruger National Park. The little tyke, who lives in the wild with her herd in South Africa, is thought to be only three weeks old. The baby’s unusual colouring sits in stark contrast to the adults in the herd, who are all a similar shade of the grey we’ve come to expect from the mammalian species. Safari ranger Tim Jansen van Vuuren, who pictured the calf, said the rare colouring is caused by leucism. It’s a condition which causes a partial loss of pigmentation – not to be confused with albinism. It is a genetic disorder that will affect them for life. This is by far one of the most interesting things I have seen in the wild. Things like this are not very well documented so it’s very interesting to witness as you won’t find things like this in books. The ranger was leading a group through the MalaMala Game Reserve last month when he made the fortuitous sighting. The mammal, the smallest of the herd at no older than two or three weeks at the time, was surrounded by her family as she eagerly frolicked and played in the sea of green grass. Amazingly, the animal isn’t the only pink-appearing species out there. The little elephant doesn’t have a name but, surely, with the release of a live-action remake of Disney’s Dumbo on release in cinemas soon the comparison will be drawn. Let’s hope this real life Dumbo’s story is less sad than that of the fictional character, who lives his life trapped in the circus with some evil humans who want to make him the main attraction for his larger-than-average ears, even for an elephant.